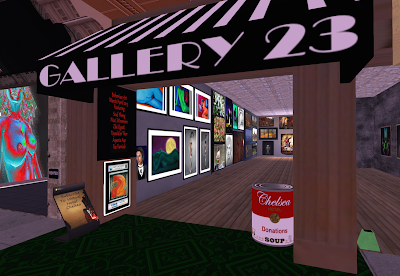 Opening today at Gallery 23 in the Virtual Hotel Chelsea district is a group exhibition curated by enola em (Enola Vaher) that features several recent works by me, so this is a little bit of a self-serving plug. :) I've included photography of Hazardous, Venexia, Roche and Manilism, plus a free gift. The exhibition, which also displays artworks by Soul Yheng, Nicci Winsmore, Toysoldier Thor, Asperix Asp and Fae Varriale, will have its formal opening at 6 pm slt today, March 3, and will continue through the end of April. While you're visiting, be sure to investigate some of the many other gallery spaces around the Hotel Chelsea—it's an engaging arts district with character, and the hotel itself (where you can rent a room or suite) is fun as well.